Luca Giordano constitutes an important link between Italy and Spain in the last decades of the 17th century and a clear example of the cultural exchange that arose from the movement of artists and works across Europe. Born in Naples, at that date part of the Spanish Crown, Giordano trained in the studio of the Spanish painter José de Ribera, who was the greatest artist of the day in the city. After an initial period influenced by Ribera’s style, Giordano came to dominate the art world in Naples through his unique fusion of the Neapolitan tradition with the most expansive Baroque manner exemplified by Pietro da Cortona in Rome. In contrast to his master Ribera, Giordano’s fame was established on the basis of his skill in the production of major fresco schemes, 1 helped by his proverbial rapidity in his handling of the brush. Notable among Giordano’s public commissions was his participation in the frescoes in the old church of San Antonio de los Portugueses, by then under the care of the German community at Court. He firstly repaired the damage to the large dome with its Glory of Saint Anthony by Juan Carreño de Miranda and Francisco Rizi (1662-1666). Ultimately, Giordano’s work on the church totally transformed its interior as he substantially altered Carreño and Rizi’s work and extended the frescoes across all the walls with scenes from the life of Saint Anthony of Padua and images of royal saints associated with the Spanish monarchy. Giordano completed this project between 1699 and 1701, with some interruptions. Fortunately, it has survived intact to the present day. 3 In order to prepare this ambitious project he executed a large number of preparatory drawings and studies of both the principal scenes and figures and of details and secondary figures. In cycles of this type Giordano habitually made use of numerous small angels and zephyrs that acted as linking elements between the various scenes as well as functioning to enliven the fictive space. This new drawing, with its graceful and charming subject and deft, free handling, contributes to a better understanding of the artist’s creative procedures in his final years. By that date Giordano made use of a variety of media in order to experiment with effects of shadows and textures that helped him to select a final option. For this reason black chalk was the medium most suited to his innate rapidity, creating firmly defined or agitated strokes depending on the movement of the artist’s hand. 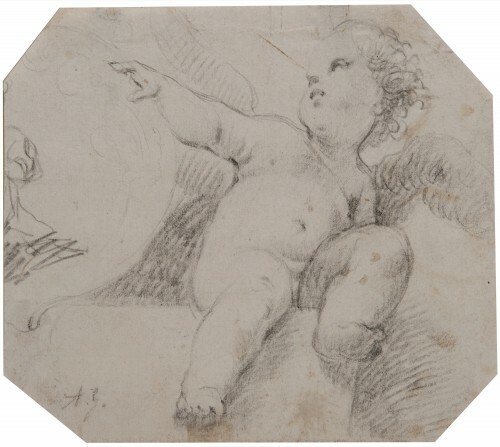 In addition, this was an habitual technique among Madrid artists at this date and the first generation of Baroque court artists, led by Carreño and Rizi, are characterised by their distinctive drawings in black and coloured chalks. As a result, it is possible that Giordano tried out a method that he discovered in the context of his new surroundings in Madrid, as was the case with some of his paintings of this period. For Giordano’s work, see Ferrari, Oreste and Scavizzi, Giuseppe, Luca Giordano. Naples, 1992 [new ed. 2000]; and Ferrari, Oreste and Scavizzi, Giuseppe, Luca Giordano. Nuove ricerche e inediti. Naples, 2003. Ferrari, Oreste and Scavizzi, Giuseppe, Luca Giordano. Naples, 1992, vol. I, pp. 123-155. On the Spanish period, see Luca Giordano y España [Alfonso E. Pérez Sánchez, dir.]. Exhibition catalogue, Madrid, 2002; and Hermoso Cuesta, Miguel, Lucas Jordán y la corte de Madrid. Una década prodigiosa 1692-1702. Saragossa, 2008. On the problem of the fresco prior to Giordano’s arrival, see Aterido, Ángel, “Mitelli, Colonna, Velázquez y la pintura mural en la corte de Felipe IV” in Bolonia y España. Siete siglos de relaciones artísticas [eds. A. Serra and J.L. Colomer]. Madrid, Centro de Estudios Europa Hispánica y Fundación Carolina, 2006, pp. 241-264. Gutiérrez Pastor, Ismael and Arranz Otero, José Luis, “La decoración de San Antonio de los Portugueses de Madrid (1660-1702)” in Anuario del Departamento de Historia y Teoría del Arte, XI, 1999, pp. 211-249. Fecit. Spanish Old Master & Modern Drawings. Madrid, José de la Mano Galería de Arte, 2010, pp. 21-23. Scavizzi, Giuseppe, “New Drawings by Luca Giordano” in Master Drawings, XXXVII (2), 1999, pp. 119-122 and 137; Ferrari, Oreste and Scavizzi, Giuseppe, Luca Giordano. Nuove ricerche e inediti. Naples, 2003, pp. 115 and 237. Luca Giordano, 1634-1705. Exhibition catalogue, Naples-Vienna-Los Angeles, 2001-2002, Electa Napoli, 2001, p. 431; Ferrari, Oreste and Scavizzi, Giuseppe, Luca Giordano. Nuove ricerche e inediti. Naples, 2003, p. 116.